Tibor de Nagy Gallery is pleased to present a show of new paintings by Delia Brown. This will be Brown’s first exhibition at the gallery, and her first in New York City since 2010. Brown currently lives and works in Los Angeles. The exhibition Demoiselles d’ Instagram, comprises six paintings, in which Brown explores how our high-tech culture encourages and facilitates a preoccupation with our own image, and shines a light on the flattening of our relationship to the larger world we inhabit. Specifically, Brown mines the “selfie” sub-genres of the mirror selfie and the gym selfie, in which the subject’s smartphone is included in the image. Brown alludes to the ways self-centered “self-improvement” (through diet, yoga, body-building, etc.) have come to replace other ennobling pursuits that would prioritize our inter-connectedness. Surrounding the women, who seem perpetually stuck in a stunting relationship with their own images, we see exagerratedly cute harp seals swimming, floating, and dying, as well as polar bears barely hanging on to breaking and shrinking ice floes. The endangered animals act as a conscience, lost on the female subjects, alluding to the vast world of suffering and need that the women’s device-induced myopia eclipses. Brown has always worked in thematic series; her past areas of inquiry have included affluence, indulgence, and indolence. She often appeared as a character in her own paintings, keeping the point of view personal and passionately ambivalent, always implicating herself in the critique. The artist both identified with and was troubled by her subjects and their aspirations. This impulse and dynamic continues in her new work. Since receiving her MFA from UCLA in 2000, Brown has had numerous solo shows at D’Amelio Terras, Margo Leavin Gallery, and Baldwin Gallery, among others. Her work is in the permanent collections of The Los Angeles County Museum of Art, The Seattle Art Museum, and The Berkeley Art Museum and Pacific Film Archive. She is currently included in the exhibition “Soft Corners” at Richard Telles Gallery, Los Angeles. Through June 17. Tibor de Nagy, 15 Rivington Street, Manhattan; 212-262-5050, tibordenagy.com. Pablo Picasso’s “Les Demoiselles d’Avignon” (1907), a painting depicting prostitutes on a notorious street in Barcelona, has served as both a cornerstone of modern art and Exhibit A in arguments about women being objectified and exploited in Western art. But what happens when women turn the lens on themselves, posting similarly suggestive or sexualized images on social media? Delia Brown uses this idea as a springboard for “Demoiselles d’Instagram” at Tibor de Nagy. Several paintings here feature women taking “gym selfies,” a subgenre of Instagram self-portraiture. Cute harp seals are neatly woven into the compositions, suggesting the wild disparities of social media feeds, and one painting roughly mimics the composition of Picasso’s “Demoiselles,” with its shifting, jarring perspectives and distorted figures. Ms. Brown’s titles, made up wholly or partly of emojis, are a nice touch, too. 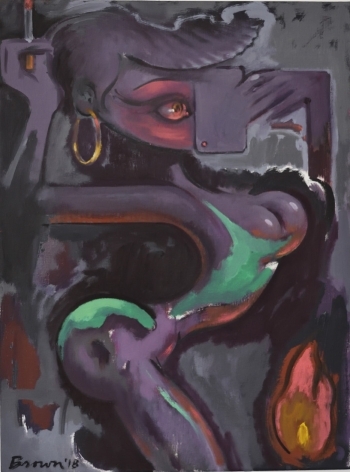 Ms. Brown’s acrid palette and stylized, often grotesque figures signal a departure from her earlier, more sedate realism. In the same way Picasso cribbed from African sculpture to almost-invent Cubism in his “Demoiselles” (full-blown Cubism came a year later) Ms. Brown’s ladies echo the exaggerated femininity of Japanese anime; Lisa Yuskavage’s paintings; Dana Schutz’s reduxes of Willem de Kooning’s Cubist-inspired reduxes of Picasso; the graffiti aesthetic of Kenny Scharf; and the brilliantly weird figurative paintings of 20th-century outliers like late-Francis Picabia and Leonor Fini. In the end, however, women representing themselves via social media do not fare better here than they did in Picasso’s misogynist universe. (And while competent and often clever, Ms. Brown’s exhibition doesn’t constitute a comparable, seismic shift in the history of painting.) Society and the beauty industry’s demands may shape these representations, but rather than “victims” of sexist body culture, the “Demoiselles d’Instagram” appear to be flagrant perpetrators.